Will we rally for the most epic struggle humanity has ever faced? While interviewing Jill Stein, Green Party Presidential Candidate in 2012, for the weekly Occupy Radio show that I co-host (listen here), it seems that she, like many of us, is frustrated by traditional politics. Our conversation revolved not around upcoming election or pieces of legislation, but around building a long overdue mass movement for Peace, People, and Planet over Profit – as the slogan for the upcoming Global Climate Convergence goes. This series of marches, demonstrations, civil disobedience and direct actions being planned for Earth Day to May Day 2014 is intended to set the ground for a global strike in 2015. The time has come to move out of traditional politicking and into the arena of concentrated, coordinated, effective nonviolent struggle. Nonviolent struggle taps into a source of social and political power that often lies unutilized by the citizens. It is our ability, inherent right, and freedom to give or withhold support; to offer or withdraw our willing cooperation; and to obey or disobey orders, commands, and unjust laws. When the populace of a nation effectively refuses to provide assistance to a corrupt regime, the regime collapses. When the people are able to disrupt the normal operations of a society over a sustained period of time, they are then able to leverage their collective power to make demands and back them up with tangible sanctions that impact the empowered class’ ability to rule. The citizens of the United States remain fairly ignorant of these dynamics. The basis of social and political power is not (as we are taught in school) voting, petitioning, sitting on juries, or demonstrating. Rather, effective power lies in our collective ability to wage organized civil resistance in the forms of boycotts, strikes, sit-ins, shut-downs, etc., and also in acts of non-cooperation aimed at impeding the operations of the corrupt regime. Rarely do empowered political parties (in our case, the Democratic and Republican Parties) advocate the use of nonviolent struggle. To them, educating the people in such knowledge opens a dangerous Pandora’s box of powerful, organized citizenry. Once opened, the empowered parties will never be able to fully close it or control it. Thus, we see that the empowered parties rely on the sanction of State repression, imprisonment and violence to enforce their rule, not on the strength of the citizens. Truly democratic, people-based movements have nothing to fear from an empowered citizenry; in fact, educating the populace strengthens both the movement for social change and the society that endures in the wake of a massive struggle. The Green Party – with its broad, encompassing, and well-articulated platform of economic, social, and environmental justice, stand perfectly poised to tap the tremendous resource of nonviolent action. Around the world, marginalized democratic political parties have mobilized the populace by empowering them with the methods of nonviolent struggle. In some cases, the party has co-opted a growing movement, but in others, the party played an instrumental role in educating and organizing the people. Either way, the coopting or fomenting party is generally a political organization that is unable to effect change through state-controlled avenues of politics. Effective organizing for nonviolent struggle takes perseverance and courage, however, and change is not easily accomplished without mass participation by the populace. In our interview with Jill Stein, she said that the Green Party is a “survivor”, and, as I watch her and other Greens organize for the Global Climate Convergence, I see them adapting to an untenable political, social, and environmental situation in a viable manner that reflects the evolutionary adaptability being demonstrated by plants and animals all around our endangered Earth. The Greens have enormous hidden potential at this moment in history. Unhampered by the constraints of party politicking, free from pandering to corporations for donations, sufficiently marginalized to be fearless around embracing radical concepts, the Green Party has also managed to collect principled, passionate individuals who dare to stand up for our future. It is likely that by taking strong forward action on economic justice and climate change while the Democrats and Republicans delay (trying to find a way to capitalize a crisis to their advantage), the Greens will be able to tap the boiling frustration of the populace and turn it into an effective movement for social change. If the Greens fully embrace nonviolent struggle, I suspect they will win support from the fed-up, despairing citizens and restore our faith in real democracy, of the people, by the people, and for the people. To accomplish this, the Greens must be courageous enough to foment the struggle, not simply co-opt it. The American populace is disgusted with politics – and rightly so, given the shameful trajectory we’ve been on. The tragedy of the corporate-political coup that we live under is that people have lost faith in democracy. Ironically, while the citizens think democracy doesn’t work, the truth is that they have never, ever experienced true democracy. It was simply not written into our Constitution. Just as the struggles for civil rights, suffrage, and equality were making progress, wealthy and corporate interests invaded and made all citizens subordinate to their money, influence, and power. To restore Americans belief in democracy, the Greens must proactively put power into the people’s hands. They must be seen on the frontlines of the struggle. They must do the hard, tedious work of organizing. They must do the dangerous work of agitating, and strategizing. They must take the hits, publically, and still rise, indomitable. They must embody, to a single person, the evolutionary “survivor” – not the old notion of “survival of the fittest”, but the modern concept of interconnected systems, in which humanity and the Earth must forge a compatible future, together. The Greens, the people, democracy, the nation, the planet – all fates are entwined. It is by picking up the mantle of the massive struggle for Life on Earth that the hidden potential of the Green Party – and the people – will be found. 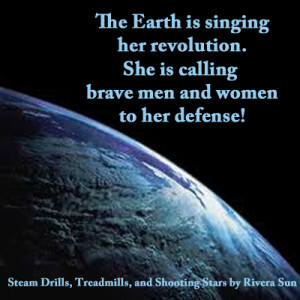 Author/Actress Rivera Sun is a co-founder of the Love-In-Action Network, a co-host on Occupy Radio, and, in addition to her new novel, The Dandelion Insurrection, she is also the author of nine plays, a book of poetry, and her debut novel, Steam Drills, Treadmills, and Shooting Stars, which celebrates everyday heroes who meet the challenges of climate change with compassion, spirit, and strength. The Movement of Movements is not one movement, but rather a collection of many simultaneously occurring movements. The Alliance for Global Justice (to my knowledge) serves as a fiscal sponsor for several organizations. I don’t know where/how you are donating, but it would be going to whatever organization you are contributing to, though the receipt will come from Alliance for Global Justice. I hope that helps.